MOSCOW (AP) — The head of Russian television channel RT, which U.S. intelligence agencies allege took part in the campaign to influence last year’s presidential election, says that having to register as a foreign agent in the United States is already hurting the Kremlin-funded outlet. Since the U.S. Justice Department gave the order and the station’s U.S. affiliate complied, RT has been shut out of news events and suffered damage to its reputation, said Margarita Simonyan, the combative and passionate editor-in-chief of the 13-year-old operation once called Russia Today. Her indignation at the early November edict came blazing through in an interview with The Associated Press at RT’s central Moscow headquarters Friday. Known as a pugnacious defender of Russia and its president, Vladimir Putin, Simonyan decried what she described as America’s retreat from its core value of freedom of the press. Her argument hinges on whether RT should be treated as a legitimate news and information network, as she insists, or as a clever propaganda arm of the Russian state, as many critics in Europe and the United States contend. RT sees itself as an underdog broadcaster carrying Russian views and perspectives onto the international media scene, contending it is similar to the government-funded Voice of America or Radio Liberty/Radio Free Europe in the U.S. or to Britain’s government-supported BBC. U.S. intelligence agencies have a different view. They stated that RT and state-funded Russian news agency Sputnik, for which Simonyan also serves as editor-in-chief, produced biased reports to undermine faith in the election process, damage Hillary Clinton’s candidacy and promote Donald Trump. Similar accusations were leveled in a recent Democratic Party report on Russian interference and by the Atlantic Council think tank, among others. Governments in Britain, Germany and France also have complained about RT and its intentions, especially its reporting around European elections. The U.S. government argues that the foreign agent designation was meant only to make clear to RT’s audience that it is a Russian station advancing Russia’s interests — and says the broadcaster is not being blocked or censored in America. Simonyan would have none of that, citing a Capitol Hill committee’s Nov. 29 decision to revoke RT’s accreditation to cover Congress. “As a journalist, you can’t pretend not to understand what it means reputationally and what it means for our journalists, what it means for our work as a journalistic organization, that now we cannot come like any other news organization, stand in line and get access to information,” she said. Consequences have been real, Simonyan said, for RT’s staffing, social media presence and commercial relationships. With its slick production values, British- and American-accented on-air talent and “Question More” slogan, the station aims to be a Russian-flavored competitor for audience eyeballs, promising not to deliver the same old news in the same old way. In the U.S., its programs can be accessed on some cable services, the internet, on social media and YouTube. Its programs follow a familiar cable news format, but often with guests who espouse views critical of Western systems. They point out the West’s hypocrisies and social ills, suggest democracies are eroding, or question U.S. policy toward Russia and the need for the European Union to stay intact. CNN veteran talk show host Larry King has a regular program on RT, as does former MSNBC personality Ed Schultz, known for pointing out problems of income inequality in the United States. 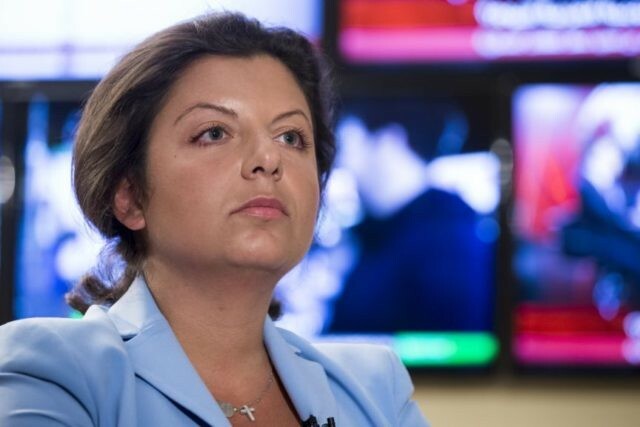 Simonyan was a budding TV journalist from southern Russia who was tapped to run RT when she was only 25, a decision she credits in part to the desire in Moscow to hire someone who was too young to be tarnished by association with the old government- and party-controlled Soviet press and broadcast structures. RT began its life focusing on domestic Russian news, but soon found the non-Russian-speaking segment of its international audience not all that interested. Russian newspaper Kommersant quoted Simonyan in 2012 as saying that Russia needed a global television network just like it needs a defense ministry and an army. In the AP interview, she said the quotation was taken out of context by a reporter who had egged her on to define why RT needed to exist. The remark has since been cited by the Atlantic Council as proof that RT sees itself as a part of Russia’s information warfare arsenal. The registration was ordered by the Justice Department under the 1938 Foreign Agents Registration Act, a law passed before World War II to label German and Nazi publications as propaganda. Simonyan said she can’t believe RT’s audience needed to know more than it already did about its source of funding. She denies that RT is any less balanced and impartial than other news companies. “Listen, your own president thinks that your media is, almost all of it, is fake.” She said Russians think all U.S. media are biased against Putin and never say anything positive about Russia’s policies. Since the registration, Russia has adopted its own law to require media companies to register as foreign agents. So far it has not been implemented. Although VOA and Radio Free Europe could be in the crosshairs, it is not clear what the practical implications would be for them, although their reporters have been barred from covering the Duma, the lower house of Russia’s parliament. Simonyan denied that RT is under the control of Putin or the Kremlin. She said for instance that she has never even spoken to Putin on the telephone. However, documents for the Russian leader’s re-election campaign name her as one of the “trusted persons” around him supporting his candidacy. In her telling, RT is an autonomous non-governmental organization that has editorial independence. She haggles over its budget with the Finance Ministry before it is submitted for parliamentary approval. She brushed off a question on whether she has ever received editorial instructions from Putin or those around him. “Our budget is controlled by so many people, including the whole of the Russia State Duma, that if I listened to everyone who was complaining … about our broadcasts, I would have hung myself by now,” she said. This year, she said, RT will get about $300 million, which she pointed out is far less than the $700 million U.S. allocation to the Broadcasting Board of Governors, which oversees VOA and RFE/RL as well as several other U.S.-government-funded stations for Asia, the Middle East and Cuba. In the interview, Simonyan said she was weary of conflict, especially between Russia and the United States, countries she thinks have far more commonalities than differences.